MANILA, Philippines (CNS) — The Catholic Bishops’ Conference of the Philippines tackled climate change on different fronts and also addressed a host of other issues, from equitable education to sovereign disputes at its biannual plenary session July 6-13. 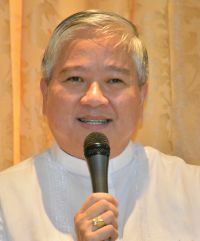 Archbishop Socrates Villegas of Lingayen-Dagupan, newly re-elected president of the conference, told Catholic News Service that the group was taking “all possible approaches” in the fight for climate justice. Archbishop Villegas said that apart from officially creating a climate desk, “a group of bishops have been assigned to draft a position paper, and hopefully it will be ready for the Paris convention … and many bishops have affixed their signature to the petition” of the Global Catholic Climate Movement. On July 5, the church in the Philippines signed on to the movement’s appeal to world leaders who will attend the Nov. 30-Dec. 11 U.N. climate summit in Paris to come up with a policy statement that will help control rising global temperatures. The campaign was to be carried out at parishes on Sundays with the goal of gathering at least 1 million signatures. Manila Cardinal Luis Antonio Tagle was the first to sign the Global Catholic Climate Movement petition, emphasizing the significance of the encyclical. During the meeting, the conference also said it was “neither for nor against” different versions of legislation that would create an autonomous region in the Muslim-majority South. The proposed region includes the stronghold of the country’s largest Muslim rebel group, the Moro Islamic Liberation Front, which is in the midst of fleshing out terms of a one-year-old peace pact with the government. Christians and indigenous people also live in the region. Some people have questioned the constitutionality of the original proposal of the government and the rebels. The rebels fear a watered-down version would not go over well among their ranks. The conference also put out an obligatory prayer to help “ease tensions” between the Philippines and China over an increasingly contentious territorial squabble in the South China Sea. On July 7, a high-level delegation from the Philippines went to The Hague to present its case against China at the Permanent Court of Arbitration. China, which rejects the case and is not participating, has said it has “indisputable sovereignty” over the sea’s hundreds of islands.